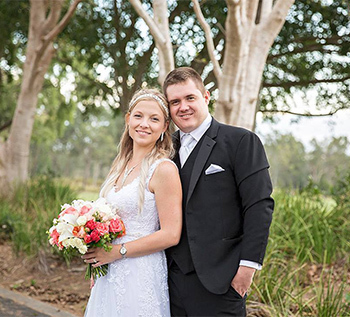 Hi Marilyn, We had a fantastic honeymoon and we were so delightfully thrilled with all aspects of our wedding and have since had so many compliments about our Wedding Ceremony. 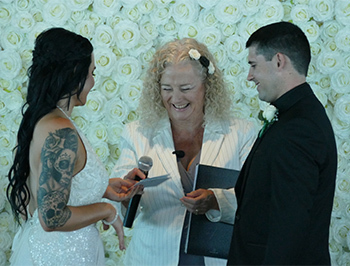 My husband James and I came across Marilyn after surfing the web for hours and hours for the perfect celebrant who would be able to create a ceremony that completely reflected who we are as a couple. 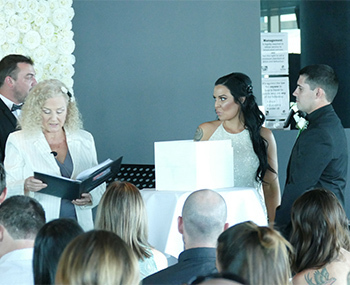 We were after a creative ceremony, with elements a little unusual and unique. 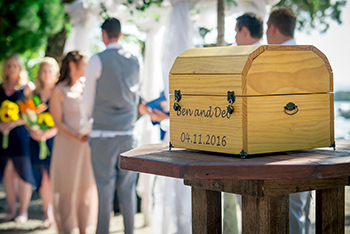 We loved the idea of the “love story” as that is something all couples hold special and what a better day to celebrate that story than on your wedding day! 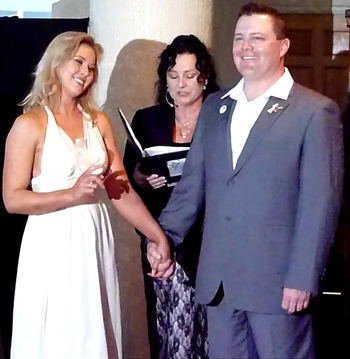 After scrolling down so many testimonials and reading more about Marilyn, we decided to meet with the lady herself. 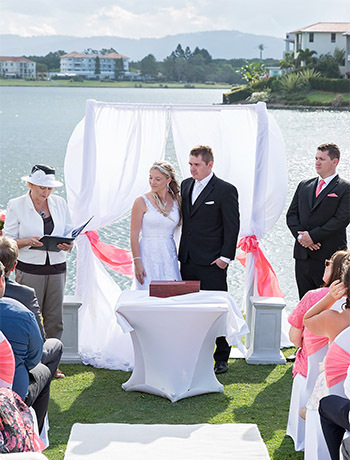 Marilyn showed us numerous of suggestions to help us achieve our dream ceremony and her personality was so friendly and it just seemed so fitting to our wedding day, so we quickly booked! 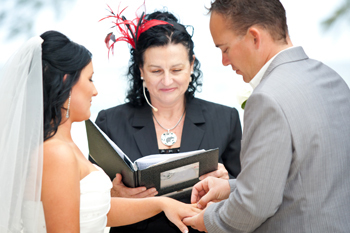 Although it was still well over a year until our wedding date, Marilyn was more than happy to start working on our ceremony with us as one of the very first things we did. 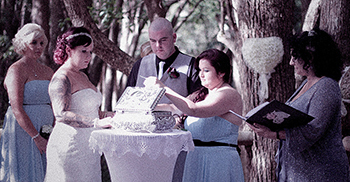 I’m sure she had so many other ceremony’s to map out before ours, but she never let on that it was too early or too much trouble. 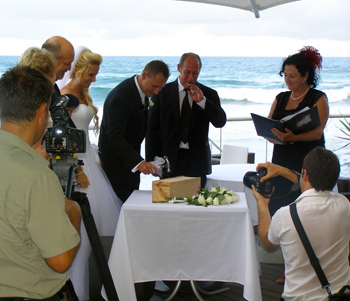 In fact it worked out so well as we had plenty of time to perfect our ceremony exactly the way we wanted it well in advance and well before the wedding plans ramped up and we wouldn’t have had enough time to dedicate the thought we gave it. 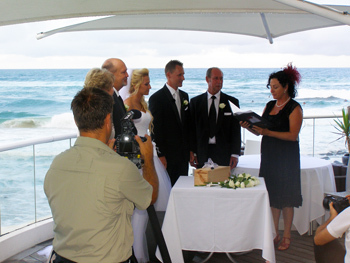 With Marilyn’s help we had it sorted months and months before our big day! 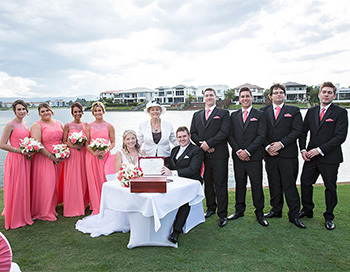 On our wedding Day Marilyn arrived early as promised and went to visit James and the boys to make sure they were all up to scratch on ceremony movements and timings. 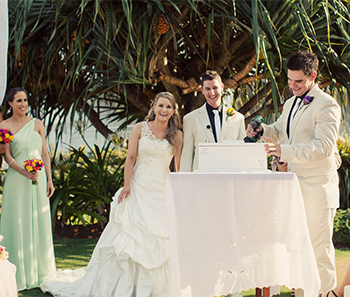 Her delivery of the ceremony was fantastic, she told out love story with such enthusiasm! 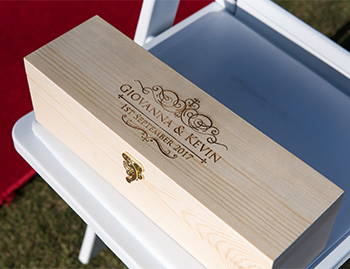 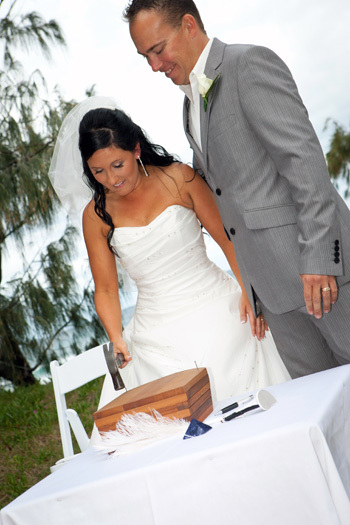 Our guests loved her special touches, such as the wooden box idea. 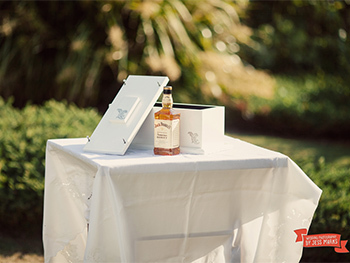 We had our best man construct a wooden box, during the ceremony we had a nice bottle of scotch, and our love letters to each other sealed shut. 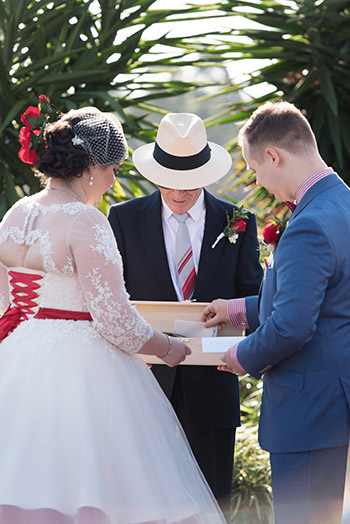 It was the touch that really set our ceremony apart from lots of others we have attended. 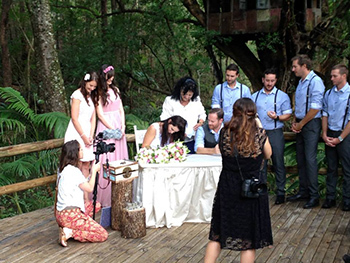 Marilyn is simply fantastic and made it seem as our big day was just as special to her as it was to us! 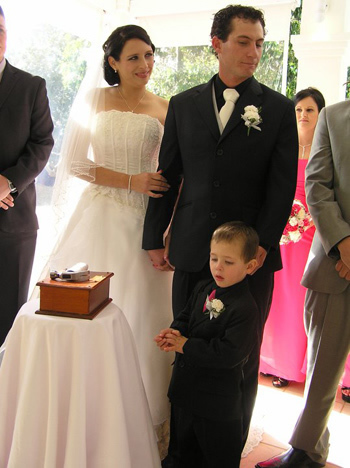 I have also attached a few pictures that help to show the little “Marilyn touches” that we loved so much at our wedding. 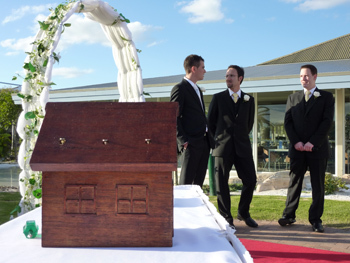 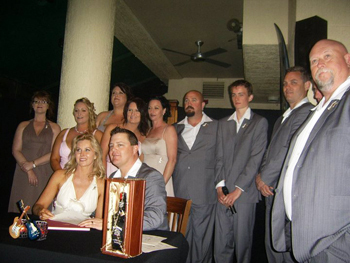 The Wooden Wedding Box Ceremony is a Romantic Dutch tradition originating in the Netherlands. 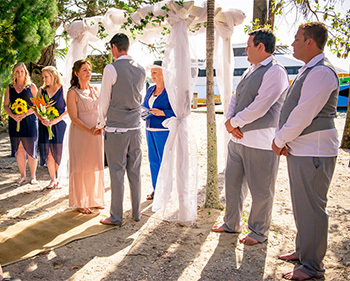 This is certainly one of the most unique and romantic wedding ideas that has been created and a huge hit with family & friends. 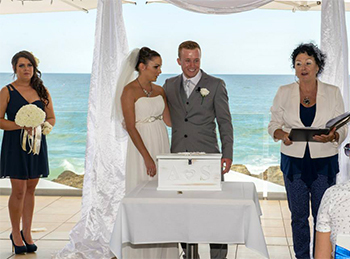 Seemena & Thomas bought a beautiful Silver Wedding Box and a heart shaped lock to seal their Wedding Box during the ceremony. 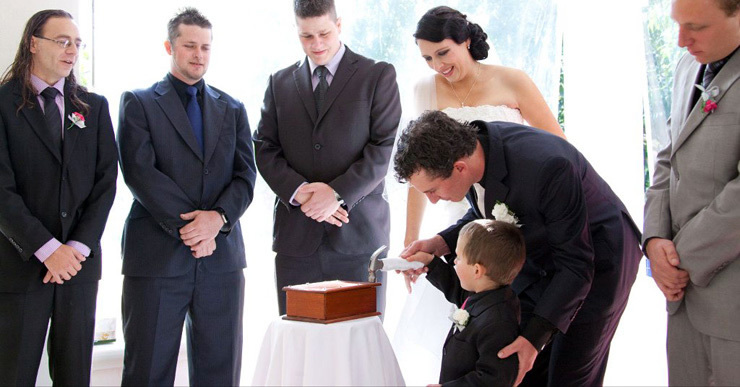 The lock had their names engraved on it.